Homemade yummy pav bhaji is very tasty delicious Indian recipe .It is very simple and easy recipes. Here i give you a simple methods to make this recipe. To prepare this homemade yummy pav bhaji recipe firstly, wet potatoes. Microwave potatoes for 5 minutes. Peel and mash coarsely. 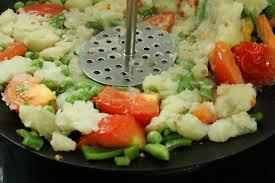 Now, In a micro proof dish, put carrots, peas, cauliflower and cabbage or capsicum. Add 1/2 cup water. Cover & microwave for 5 mins. Mash the potatoes with a potato masher. Put oil, onions, ginger-garlic paste, 2 tbap pav bhaji masala and haldi. Mix well in a dish. Microwave for 5 minutes. Now, add tomato puree, roughly mashed vegetables potatoes, butter and salt. Add one cup water. Cover and microwave 5-6 minutes. 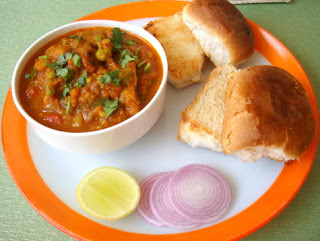 To prepare this homemade yummy pav bhaji recipe at home, firstly take a cooker add potatoes, peas, cabbage or capsicum, onion, tomatoes and water. Now put it into bowl and mash it using a masher. Now, take a pan add oil and jeera. Fry it till the cumin seeds or jeera light brown. Now add turmeric powder. Cook it for 1 minute. Add soya sauce, chilli sauce, tomato sauce and salt. Add mashed vegetables in it. Garnish it with coriander leaves and grated cheese. You can also add any other vegetables like ghiya (bottle ground) or french beans.